Mirrors inside the fort, the only such structure built by a Sikh ruler, have disappeared, so have the stone carvings; the main gate is in a shambles writes Aman Sood in The Tribune. Qila Mubarak, the only fort built by a Sikh ruler, withstood several attacks in its over 250-year history. Today, it is in ruins and fighting a battle for survival. The monument had drawn Britain’s Prince Charles and his wife Camilla’s attention during their Patiala visit. Once the residence of the erstwhile royal family of Patiala, the fort with a commanding entrance and intricate arches is dying a slow death owing to neglect by the authorities. “In my knowledge, nothing has been done for the past several years to carry out restoration work inside the fort,” said a senior Archaeological Department functionary. The fort, known as ‘Narha Durgh’, is losing appeal and is no longer one of the top tourist destinations in the state. For this, the Department of Cultural Affairs, Archaeology and Museums and the Archaeological Survey of India are much to be blamed. Sources said many a time officials visited the fort, but the state government did not release enough funds for restoration works. “Contractors are reluctant to start work as the promised payment is usually delayed because of red-tapism. We undertook some work in 2005 and 2009, but it was negligible,” said a government official. The foundation stone for the fort was laid by the founder of the Patiala dynasty, Ala Singh, in 1754. It was completed by his grandson and successor Maharaja Amar Singh in 1763. Later, it came to be known as the “fort of triumph”. “The buildings inside the fort once reflected a blend of Rajasthani, Pahari and Mughal cultures with its art work in the Guler style. The fort is associated with Sikh culture and needs to be preserved if we want the coming generations to take pride in their history,” said Malvinder Singh, who belongs to the royal family of Patiala. “We have some funds earmarked in the 13th Finance Commission, which are yet to be drawn, and only then will the restoration work start,” said SS Channy, Financial Commissioner, Cultural Affairs, Archives and Archaeology. The inner portion of the fort had beautiful mirrors. Historians recall how a single source of light could create magic inside the fort. There are no mirrors now. The intricately designed ceiling is coming off, the stone carvings are gone and the main gate is in a shambles. In 2005, the Indian National Trust for Art and Cultural Heritage (INTACH) held a “Patiala evening” at Nehru Cultural Centre, London, to showcase the archival material recovered from the fort. Financial Commissioner (Tourism) Geetika Kalha said that with funding from the Centre, restoration work would be started soon. 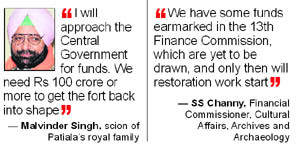 Malvinder Singh said he would take up the matter with the Union Government to ensure adequate funds for the fort. “We need Rs 100 crore or more to get the fort back into shape”, he added. Funny how cash-strapped Governments invariably manage to find funds for politicians’ vanity projects, laying foundation stones …..